The practice of painting for me has been about arriving at a visual language that conveys the absurdism of the human condition. It has been more about choosing what needs to be excluded than what is represented. 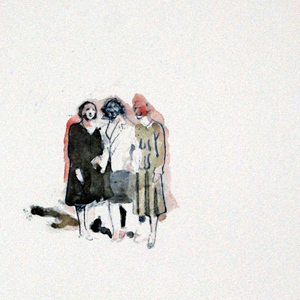 The figures in my work are alienated from an "environment," and seem frozen in time and space. They are defined by what is stripped away and live an existence where there is no possibility for action or renewal. They have nothing to interact with and nothing to struggle against, yet their expressions reveal an evident and lingering desire to act within some sort of meaningful reality. They are in a perpetual state of longing for context and purpose. The obsession with finding objective meaning will not go away, but I choose to convey these ideas with materials that are less than permanent. Using paper and watermedia adds to the absurdity of even thinking about such things in the first place. It creates further tension between the eternal and the transitory that would not be achieved by using more stable media.